The recent Standard ISO 226 concerning equal-loudness-level contours has been critically analysed. As a result, it is shown that the fitting and smoothing processes applied in the standard lead to parameter values defining equal-loudness-level contours that are not consistent with the chosen loudness function type. Serious mathematical and acoustical discrepancies have also been found that result in constant terms having an unnecessarily high numerical accuracy and a flawed phon definition, which leads to an erroneous loudness level representation. Therefore an extensive treatment of the logarithmic calculations (phon) of a loudness function is performed in this study. Finally, the author concludes that it would be desirable for the discrepancies in the standard (shown in the study) to be taken into account and corrected before publishing a new version of the standard. An international researcher group of Japanese scientists (serving as project leader) and researchers from Germany, Denmark and the United States has produced the recent determination of equal-loudness-level contours for the human auditory perception system called ISO 226:2003 (E): Acoustics—normal equal-loudness-level contours . Particularly because the equal-loudness-level contours in the standard are now based on a chosen loudness function, the equal-loudness-level contour complex is of special interest. Namely, such a function defines the upward and downward behaviour of the contours, providing an unequivocal view of how the subjective loudness grows between the contours. The author [2,3] of this study has earlier derived similar contours based on Stevens’ power law, also mentioned as an alternative loudness function by Suzuki and Takeshima . The derived contours in  were almost identical to the equal-loudness-level contours in the former ISO standard ISO 226:1987 . However, no loudness function appears in this standard, although the contours are shown as a result of mathematical expressions. In fact, purely mathematically, there are lots of mathematical expressions that could simulate such contours without any connection between the expression (and its parameters) and the acoustical or psycho-acoustical terms. It proved  that the mathematical expressions based on defined acoustical quantities and Stevens’ power law were simpler than the expressions used to achieve similar contours in the standard . In the present study, the derivation of equal-loudnesslevel contours in ISO 226:2003(E)  is first reviewed and analysed. The review is fairly critical because the author found several discrepancies which partly (at least) spoil the contour complex system shown in the standard . Problems concerning interpretations of loudness functions and, in particular, loudness levels seem to be somewhat general but also have disturbing effects on the standard . These are treated more extensively in the technical chapters of this study, which is mostly performed by following the excellent informative part (Annex C) in the standard . Finally, the author has some reservations concerning the statistical validity of the data and of applying advanced fitting methods and the fitting in general: For example, the data does not consist of a homogeneous solid sample of normal hearing people. Instead, the scattered measurements and calculations are performed by different researchers and laboratories in different countries and on different continents. Therefore the sources of error are pretty numerous. However, possible problems arising from the non-validities of the data can not be treated in detail here. where the pressures are written in dimensionless (the loudness function should be dimensionless) magnitudes of sound pressure squares (in sound pressure levels (dB)), and in the latter equation θ is taken to be 1/k. k (the root notation, see e.g. [2,3] by the author) is shown here because it refers to Stevens’ power law stating that the loudness is proportional to a distinct root of the sound intensity. In addition, it should be noted that Equations (1) and (2 and 2’) do not differ provided that the square pressure magnitude is (p/po)2, where po is the reference pressure 20 μPa, in Equation (1). However, this seems not to be the case in . The frequency-dependent exponent θ (or the root k) is the most important and crucial quantity when considering, in particular, loudness and equal-loudness or equal-loudness-level contours according to Equation (1). Very little attention has paid to this fact in . The author has deduced  that if the parameters c and θ are determined for a type of equation like Equation (3), in each frequency band the equal-loudness-(level) contours are wholly determined. Note that θ (having the value of 0.3 at 1000 Hz according to Stevens’ power law) has the same significance at every frequency band, i.e. θ is not important only at 1000 Hz, and that θ varies depending on the frequency band. Consequently, he has derived the contours  shown in the former standard ISO 226:1987 . It is worth emphasising that θ wholly determines the growth of the loudness function (3) at each frequency band. It may seem that Equation (1) is a problematic loudness function because of the vanishing property at the threshold, but this is not the case. In fact, Equation (1) is neither a new nor a different loudness function if compared with Equation (3). Rather, Equations (1) and (3) are wholly the same, with the difference that in Equation (1) the threshold loudness (the loudness function value at the threshold sound pressure level) has been removed to zero. Then, of course, Equations (1) and (2) vanish (take the value of zero) at the threshold. However, this is not a problem because Equation (1) must also be allowed to take negative values. In fact, Equation (3) and the first part (cp2θ) of Equation (1) are similar basic loudness functions estimating the behaviour of the human auditory perception system in regard to sounds that can be heard. This implies that, if the threshold has been determined e.g. for people with normal hearing, people who have very good hearing (hearing sounds below the general threshold) must also have a loudness function. Equation (1) then takes negative values and does not vanish, and the threshold loudness-level contour may be seen rather as one of the equal-loudness-(level) contours of the whole system. If so, the threshold loudness-level contour should be considered of particular importance, because it is the only contour that is based on a human subjective impression or experience resulting in an exact expression: “The sound cannot be heard”. Possibly as a consequence of this fact, the least scattered values of the sound pressure levels around the fitted loudness level contours lie at the threshold contour (best fit) in the standard . Upwards the fittings seem to become poorer and poorer. where cf is a combined dimensional constant of b, c and U in Equation (4) depending on frequency as c in Equation (1). It is clear that also in Equation (1) c must depend on the frequency. However, both c and cf are (by definition) independent of the pressure (or sound pressure levels). Therefore cf can never have such a value that these equations are the same, i.e. the loudness functions (1) and (4) are surely different (provided that ). It also seems that the desire of the international group to include two or three different processes or parts in a loudness process has been reduced to a foreign exponent β in the “original” loudness function (1). One can see that the chosen loudness function (1) with the dimensional constant (replacing c in Equation (1)) has been set at the same value as the loudness function in the 1000 Hz frequency band. Here, of course, the right-hand side of Equation (7) represents a known loudness function at 1000 Hz with a known dimensional constant (= 1) and the known exponent θ = αr (= 0.250). including LU as a frequency dependent weighting on the sound pressure level domain . The latter equation, a form of Equation (6) would have helped and simplified the fitting and smoothing processes considerably. Note here that if LU is solved from Equation (9), LU only depends on the frequency (band). Thus, after determining αf, LU is wholly determined independently of the equal-loudness-level contour considered (the threshold contour, for example). In particular, here Equation (11’) is simpler and clearly more informative than Equation (11) because the chosen loudness function type is formally shown (in brackets) with an explicit dimensional frequency dependent constant showing that the constant terms with high numerical accuracy of Equations (10) and (11) are not a result of the fitting and smoothing processes applied. resulting in a type of a linear Equation (9) for Equations (10’) and (11’). However, except at 1000 Hz this is not the case (even though as stated in the standard : “LU values were re-estimated by using Equation (C.1) (Equation (1) here) with values of αf”), as can be found by calculating with the tabulated parameter values given in Table 1 . Therefore, the applied loudness function remains unclear and impossible in the standard . 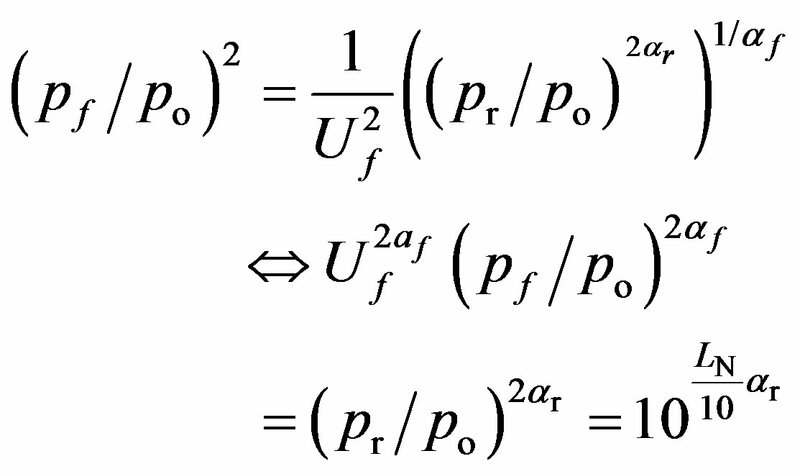 Consequently, in addition, although “the contours exhibit a pattern of parallel displacement”  (parallel displacement: ΔLN/ΔLp = constant at each frequency band independent of the sound pressure level), Equations (10’) and (11’) do not show such a property generally to hold. In this respect the difference between  and the former standard  is rather significant. The equal-loudnesslevel contours in  exhibit almost wholly a pattern of parallel displacement, as a result of which the author  has derived the terms c and θ (at each frequency band) of a loudness function type of Equation (3) (or Equation (1) as well). On the other hand, it may be possible that the loudness function differs from a simple power function. 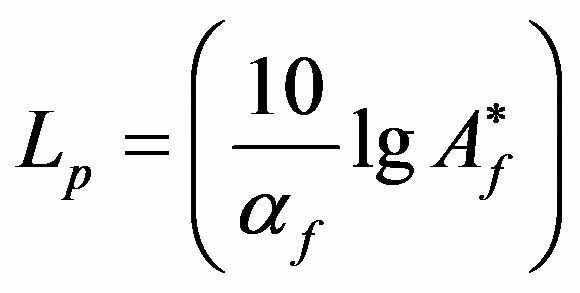 For example, perhaps the power exponents αf depend on sound pressures. However, such a case cannot be controlled (without any additional definitions) by mathematical fitting methods and solving the parameters for a function, which differs from the chosen basic loudness function. which results from the assumed loudness function type of Equation (3) with the chosen parameter values at 1000 Hz (c = 1 and θ = αr = 0.250), not depending on the fitting and smoothing methods used to determine the parameters αf and LU at the other frequencies. confirming that the loudness level in phons of a certain equal-loudness-level contour coincides at 1000 Hz with the sound pressure level expressed in decibels. This seems to be in accordance with the loudness level as defined in the standard  and literature: “Value in phons that has the same numerical value as the sound pressure level in decibels of a reference sound, consisting of a frontally incident, sinusoidal plane progressive wave at a frequency of 1000 Hz, which is judged as loud as the given sound.” It is worth noting that the result of Equation (15) seems also to be in accordance with the data (except the threshold contour) shown in . Table 1. Parameters used to calculate the normal equalloudness-level contours . contour crossing point at the dB axis of 1000 Hz), revealing the subjective sense of the contour complexes upwards and downwards. The connection between the loudness function and the loudness levels are considered next. A—When loudness levels are computed from calculated loudness values, the results may differ from those obtained by subjective judgement. It is important, therefore, to state whether the values have been calculated or have been measured by other means. B—The term phon, without a qualifying abbreviation, should be reserved for the expression of loudness levels determined by direct subjective measurement. Mathematically the definition (Equations (16) and (17)) of a phon P is rather similar to that of a decibel. The difference is that the logarithm has a base of two (instead of ten), and additionally the definition includes an additive part of 40 phons and a reference value of 1 sone. The latter have a certain meaning, as seen later. Purely mathematically, P only shows the value of the loudness magnitude (the magnitude of the loudness function or its estimate) in powers of two multiplied by ten and with the additive constant 40 phons. Because of the logarithm base and the multiplying factor, P always increases by ten when the loudness magnitude S is doubled. One can understand here that the properties above of P are purely mathematical and in no way concern the loudness S, which is only required to be positive. Therefore, it is important to see that the loudness problems only concern S (l here) and that any of these problems cannot be solved based on the manner of representing the results (e.g. in phons or any other logarithmic quantity) . The use of logarithmic representations concerning loudness magnitudes seems only to originate from the fact that a loudness function appears to be (in the first approximation, at least) an exponential of the sound pressure level or a power function of sound pressure. Finally, it should be noted that the two wholly different methods in the standard ISO 532  (the first method by S. S. Stevens, L. Cremer, G. Plenge, and D. Schwarze and the second method by E. Zwicker) both apply the phon definition according to Equation (17) when converting sones to logarithmic loudness levels. where l1000 Hz is the loudness function at the 1000 Hz band and C is a multiplicative constant inside the logarithm depending on the loudness function, not otherwise affecting the loudness function as such by any means. giving 40 phons for the loudness function at 1000 Hz with the sound pressure level of 40 dB as the respective Equation (15) based on the standard . However, the other quotations, e.g. for 30 dB and 50 dB in  become, according to Equation (21), the respective quotations 31.7 and 48.3 phons, differing from the value at the crossing point at the dB axis of 1000 Hz. which is formally similar to that of Equation (15), giving similar loudness level values for a power function with an exponent of 0.3. However, only the latter, Equation (23), is consistent with the phon definitions shown in the standard , for example. Thus, it seems that the loudness function exponent (αr = 0.250) in the standard  has been applied carelessly and erroneously when performing the loudness magnitude conversions. Of course, such conversions must be unequivocally defined. However, this is not the case in . Therefore, clearly something is seriously wrong also with the loudness function and its relation to the phon levels in the standard . Finally, although the changes of the contour shapes may be reasoned, a basic international standard connecting the human auditory perception to all kinds of acoustics, cannot be derived based on a questionable loudness function, including additionally misleading and perplexing mathematical manipulations and elementary misunderstandings about earlier definitions of acoustical terms. Starting by reviewing the chosen loudness function type in the standard ISO 226:2003(E) , it has been found that this function does not differ formally from the basic loudness function type given by S. S. Stevens. It has been shown that the fitting and smoothing processes applied in the standard  lead to parameter values defining equalloudness-level contours that are not consistent with the chosen loudness function type. The reason for this seems to be that the parameters are fitted to a needlessly complicated form of the basic loudness function. Several other discrepancies have been observed. The mathematics used in the standard is ambiguous and perplexing. The main equations in the standard  seem to include equations in unnecessary forms and puzzling constants. An alternative identical form of the equations has been derived and shown. Additionally, the phon definition seems to be lacking in the standard . However, when using a mathematical loudness function, the logarithmic representations of such an expression must also be mathematically defined. Finally, although the changes of the equal-loudnesslevel contour shapes may be well reasoned, this is not the main problem concerning loudness problems. Much more important is the spacing between the contours—explained, in fact, by the loudness function. In this respect the standard  clearly differs positively from the former standards. However, it would be desirable for the discrepancies and oversights in the standard  shown here by the author to be taken into account and corrected before publishing a newer version of the standard. It is also recommended that a loudness problem is approached and analysed more exactly and extensively than in the present standard . Of course, the consistency between the final result (the equal-loudness-level contours) and the starting assumptions must hold. International Standardization Organization, “ISO 226: 2003(E): Acoustics—Normal Equal-Loudness-Level Contours,” Geneva, Switzerland. International Standardization Organization, “ISO 226:1987 (E): Acoustics—Normal Equal-Loudness-Level Contours,” Geneva, Switzerland. International Standardization Organization, “ISO 532:1975 (E): Acoustics—Method For Calculating Loudness Level,” Geneva, Switzerland.